Each year, the publication names its "Best Cars for Families" based on a combination of auto reviews, safety and reliability ratings. Also, the judge's panel takes into account seats and cargo volume, plus the family-friendly features such as its in-car wireless network and surround-view cameras. This year the judges looked over 127 new cars from the 2018 model year. Out of this number, the final winners were in 11 automotive classes. This year, Audi ties for the most awards by an individual brand. In making its award, the magazine said the “Audi Q5, the Best Luxury Midsize SUV for Families, and the Audi A6, the Best Luxury Midsize Car for Families, respectively, both won in large part because their back seats are larger than the competition." Each has "extra space" that "makes it easier to install car seats, keep kids in boosters from kicking the front seats and gives tensor older relatives plenty of space to stretch out." Each vehicle has many driver assistance features, including automatic braking, surround-view cameras, and lane-keeping assist. 2018 Q5 – This is the third year Q5 has won the "Best Luxury Compact SUV" award. 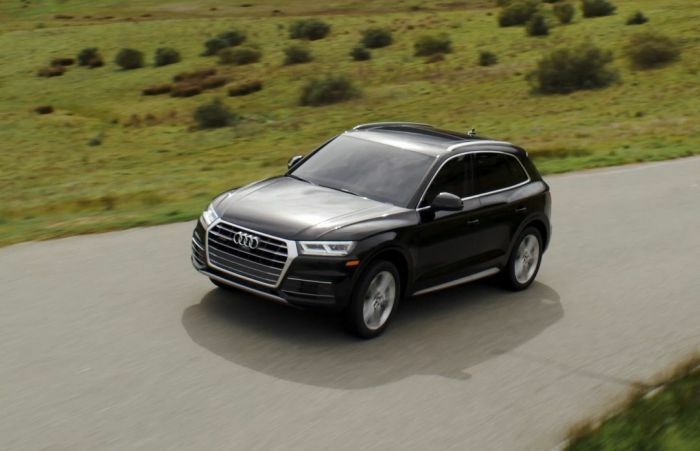 The editors of U.S. News & World Report, praised the Q5's crash test scores, active safety features, and its standard quattro® all-wheel-drive. Q5 also sports infotainment features such as Apple CarPlay™ and Android Auto™ compatibility. The Q5 offers the performance of a sports sedan, combined with the versatility of an SUV all in a package for five. Its technology package includes features that help operators. 2018 A6 – It's interesting how Audi doubles down on its success. For instance, when it has a winning sedan, the development team mixes things up a bit and comes up with a high-performance version. That's why the A6 offers an attractive exterior with S-line elements and the telltale Singleframe® grille as well as LED daytime running lights (DRL). The A6 uses a new powerplant. A revised engine joins the standard 2.0-liter turbocharged four. The second engine choice, the 3.0-liter TFSI V-6, combines with the automaker's quattro® all-wheel-drive system to produce a potent power team. For 2018, the interior now offers multifunction steering wheel with shift paddles. The dash wraps around and features a central infotainment display. There are eight-way power front seats and the A6 can carry up to five.